The Vegan Treats Gourmet Chocolate Boxes comes in two options. Their standard option is $94.95 and their ultimate option, which packs in a few extra treats, is $124.95. 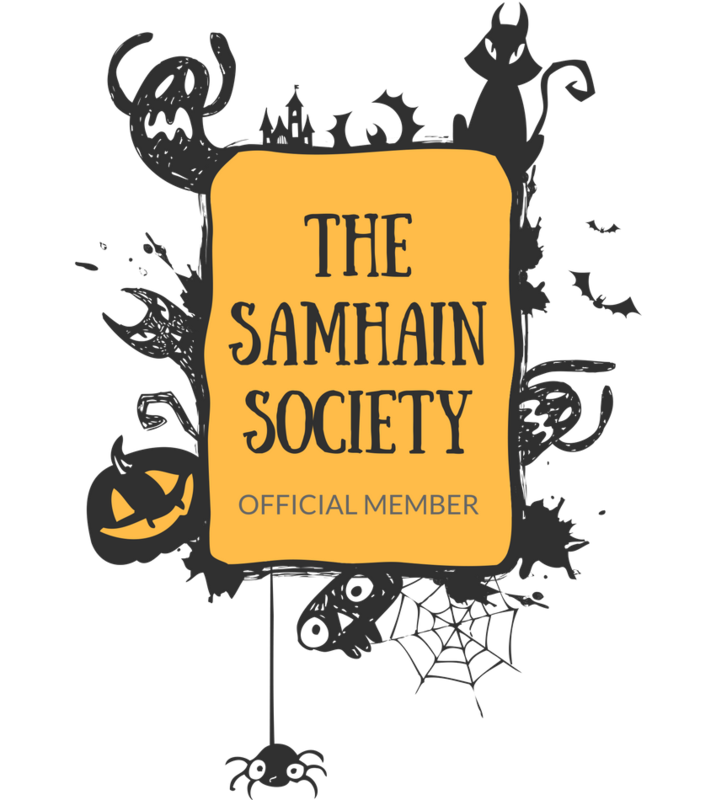 I've been pleased by their boxes in the past (check out my dissection aka review of their 2015 box HERE and you can check out past year's boxes via the links at the end of this post), but I realize the price is steep and may not be an option for everyone. 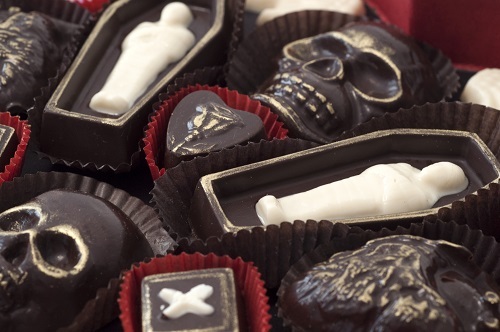 However, if you are really looking to treat yourself or that special spook in your life, the Fatally Yours box is the way to go! 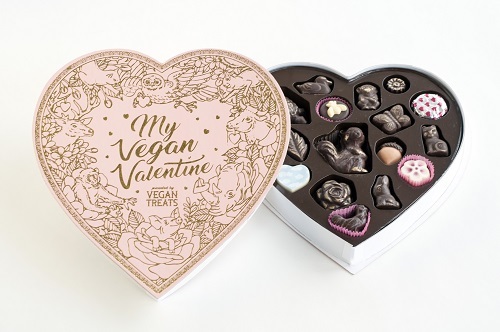 Descriptions of the goodies included in both the Fatally Yours and My Vegan Valentine boxes for 2018 are listed below! Black as your soul and as ultimate as your love, this LIMITED EDITION Fatally Yours Gourmet Chocolate box is absolutely to die for. 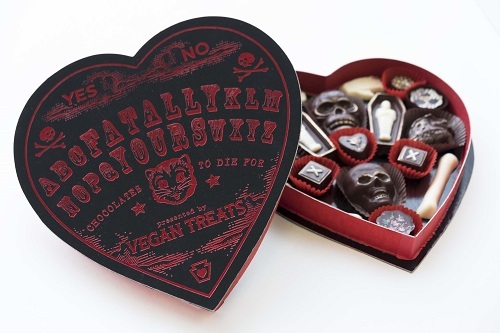 Packaged appropriately in a custom black heart with red-embossed "Fatally Yours." Each chocolate is delicately handmade and finished in gold leaf before being placed in a custom made insert tray for extra protection before conjuring. Bunnies, bees, squirrels, oh my! Cotton candy clouds, banana cream pie chimpanzees, and nuts about peanut butter cup squirrels are sure to make the animal lover in your life happy this Valentine's Day! Each box includes an adorable "Deerest Valentine" pin and a purrfect wild strawberry white chocolate cat lollipop. The Ultimate My Vegan Valentine includes caramel cookie stix, Betterfinger bars and our deliciously homemade peanut butter cups. Do not fret, your Valentine will not be left empty handed when the chocolates are gone! A limited edition custom screened "My Deerest Valentine" keepsake print is included. Don't wait, these sell out fast! 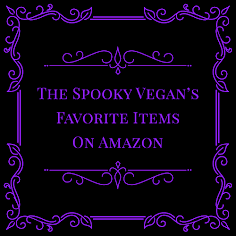 Go to Vegan Treats to order! 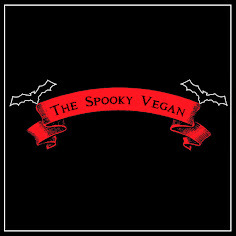 Note: I am not affiliated with Vegan Treats, I just really love their Fatally Yours boxes! 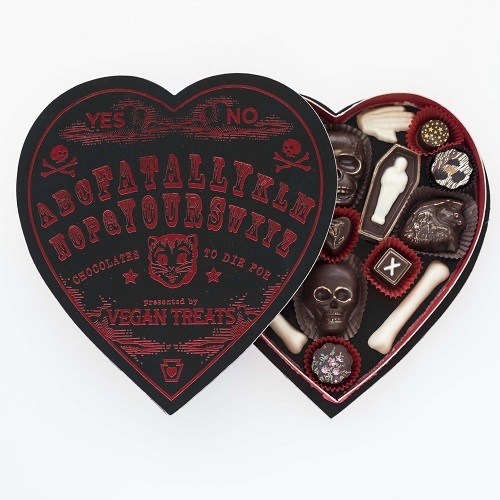 Love, love, LOVE the Fatally Yours Chocolate Box! 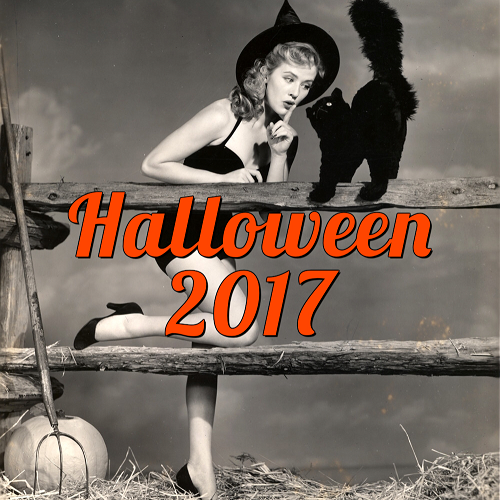 A touch of Halloween in February is exactly what I need! Thank you for posting! One day i will be able to afford this! And it hopefully won't melt on the way to Australia!